How to look good and stay warm. Beck Wadworth wearing Nobody Denim Cult Ankle Flare PowerBlk jeans. Beck Wadworth wearing Nobody Denim Siren Skinny PowerBlk jeans. Imagine how good it would be to wear your doona around in winter. But that’s not practical. Fortunately, there are outfit options that are just as comfy and cosy, and also look killer. Beck Wadworth, founder of stationery label An Organised Life and Instagram style-influencer, gives us some hints on how to keep warm, feel comfortable and look cool when the temperature plummets. “Layering can be hard in winter,” Wadworth says. You may feel like layering your whole wardrobe into one outfit to keep warm, but matching a staple pair of jeans and a high-quality knit is a less bulky and often warmer option. “I love cashmere knits, either a turtleneck or crewneck in black, grey or cream,” Wadworth says. “My go-to in winter is high-waisted denim, and then I tuck in a cashmere knit that’s warm and light, and wear it with a coat or blazer.” If she’s heading out after work with friends, she ditches the coat and adds a good lipstick. Wadworth grew up in New Zealand and had the importance of keeping warm drilled into her from a young age. “My parents told me that if you keep your head and heart warm it’ll help keep your whole body warm,” she says. This is particularly helpful advice if you, like Wadworth, want to wear cropped flare jeans or open heels in winter, which will leave your ankles or feet exposed. 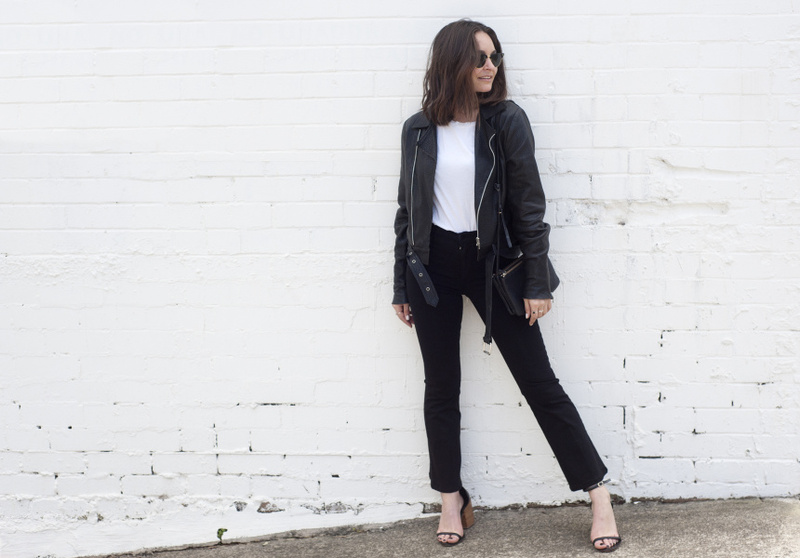 “It’s hard having your feet out in winter,” says Wadworth, “but if you’re warm everywhere else it definitely helps.” She likes to pair cropped flares with strappy heels to elongate her legs. “I don’t have height on my side unfortunately,” she says. Function and style are two important elements for Wadworth – she likes to keep her outfits simple. “I like to invest in pieces that have a bit of both,” she says. This article is presented in partnership with Nobody Denim.